Ask anyone, and they'll tell you. There's a difference between managers and leaders. Ask them what that difference is, and they may have a bit more difficulty providing a clear answer. Suddenly the words become amorphous and undefined. Somehow leadership is an intangible - a charismatic component that some people have and others simply don't. That's why, according to the ubiquitous "they," it is such a rarity. We disagree with this perspective. The difference between being a manager and being a leader is simple: Management is a career. Leadership is a calling. You don't have to be tall, well-spoken and good looking to be a successful leader. You don't have to have that "special something" to fulfill the leadership role. What you have to have are clearly defined convictions - and, more importantly, the courage of your convictions to see them manifest into reality. Only when you understand your role as guide and steward based on your own most deeply held truths can you move from manager to leader. Whether the group you oversee is called employees, associates, co-workers, teammates or anything else, what they are looking for is someone in whom they can place their trust. Someone they know is working for the greater good - for them and the organization. They're looking for someone not only that they can - but that they want to - follow. Because it is only when you have followers -people who have placed their trust in you - that you know you have moved into that leadership role. And the way you see it is that your organization is transcending all previous quality, productivity, innovation, and revenue achievements. You're operating at such a high level of efficiency that you're giving budget back to the corporation - and you're still beating your goals. You're achieving what you always dreamed could be achieved. And not only that, but it's easier than you thought. Because you're a leader. Because the classic command and control management model - which, contrary to popular belief still applies even in our most progressive 21st-century companies - is no longer in play. Sure, controls are in place. Sure, you're solving problems that arise. But it's not just you alone. You have the people in whom you've put your trust - and who have happily and safely reciprocated - to help you create organizational success. Where to start? Begin by discovering exactly what your convictions are. Clarify and codify for yourself what you believe in. Then, take a nice step back and see how those beliefs are playing out in the organization as it stands today. Don't start with an organizational assessment based on the numbers or your opinions about others. It is not about "them." It is all about you. What is important to me? What are my values, beliefs, ethics? How am I demonstrating those values, beliefs, and ethics every day? Is the larger organization designed to support my values, beliefs, and ethics? Where are the disconnects within my immediate organization and for myself with the larger enterprise? What can I do to change how I behave with my immediate organization to demonstrate my belief in them? 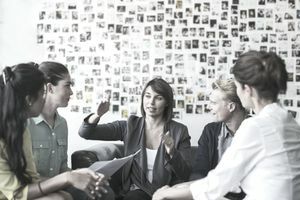 What additional assistance do my employees need to succeed ¡V and how can I ensure that they get everything they need and more to create personal and organizational success? Realistically, you'll go through this process not once, but many, many times. It is a periodic reality and cross-check to see how you're doing in your own context and, as you begin making changes, in the larger context. Because, while you can and should expect yourself and your immediate organization to make changes, you cannot - and should not - expect the larger organization to respond or follow suit immediately. It is a personal journey designed to assist you in being more - and helping those whose lives you touch to be more. Give the organization time. It'll get there. It's just a little bit slow. As you identify your convictions and begin aligning your behaviors with those convictions, you are going to need to take steps to build a collaborative culture based on where you're going. To do that, seek input from your employees about what they need and what their dreams are for their jobs and the larger organization. (They have them, you know). Talk to internal and external customers and suppliers about their needs. Find out what more and what else you can be and do to create success. Enroll and engage in conversation and communication. Sit back. Listen. Take in as much as you can. Look for trends and themes. Find out where the possibilities are - the connects and disconnects that you can effect. Be more. Be all those things you always believed about yourself - and usually bring to the rest of your life. Leaders aren't made or born. Leadership is a choice - a belief in and commitment to everything that is good and noble within you. Leslie L. Kossoff is a leading organizational thinker and consultant. Her firm, Kossoff Management Consulting, has provided guidance in the areas of executive and management development, and organizational strategy and excellence for over twelve years. Her current focus is the next generation of leadership and the generation after that.